Nina O'Brien narrowly wins the slalom to edge out a close friend and teammate. CARRABASSETT VALLEY — Heading into the slalom leg of the women’s combined event at the U.S. Alpine Speed Championships at Sugarloaf on Thursday, Keely Cashman, Nina O’Brien and AJ Hurt were separated at the top by 0.25 seconds. At the top of the slalom trail, the skiers could see only the first part of each skier’s race. O’Brien, though, wasn’t thinking about anything except her own slalom run, and it paid off as her time of 43.90 seconds was the fastest of the day and helped her leapfrog Cashman, who led after the super-G leg, for the combined title. The conditions were pristine Thursday, as they were the whole week at Sugarloaf. The sun was shining and the track held firm for the women, which made for some fast times. O’Brien’s 43.90 was four-hundredths of a second faster than Hurt’s run, which put her two-tenths of a second ahead of Hurt for the title. Hurt, 18, said the track felt brand new when she raced. Cashman, Hurt and O’Brien are teammates and good friends. There is competition between the three, but their bond is closer than their times at the finish line. Hurt focused on the lines she had to take to get on the podium. Many skiers throughout the day said that the course was tougher than most slalom courses on combined events. Cashman’s time of 45.62 was the fifth-fastest time on Thursday, placing her third. 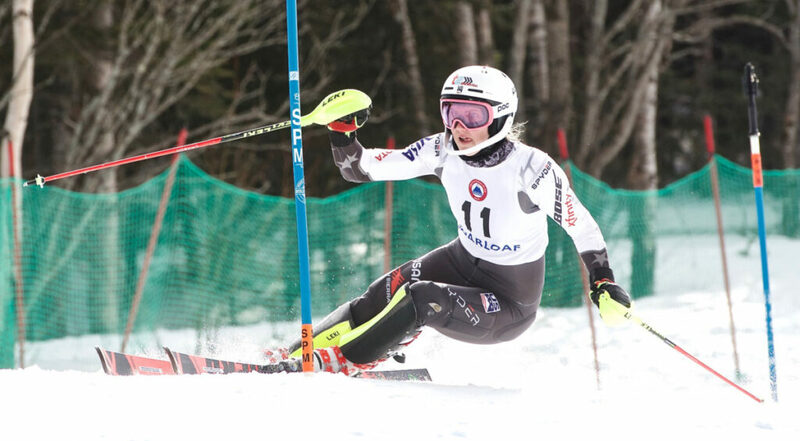 Carrabassett Valley Academy’s Ella Spear entered Thursday’s slalom in 12th place and finished 11th overall in the combined.